of introducing them to salvation. But is that what God has commanded us to do? Very few Christians seem alarmed at the number of "gospels" that are being preached today in "Christian"
Now gospel", the "social justice gospel" , etc., etc. ad nauseum. 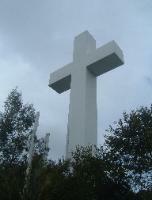 the Cross is to them that perish foolishness, but to us which are saved (Gr. "sozo"), it is the power of God". OBJECTIVES AND ARE, IN TRUTH, OPPOSING GOD, AND THEMSELVES (2 Timothy 2:25). save Jesus Christ and Him crucified.